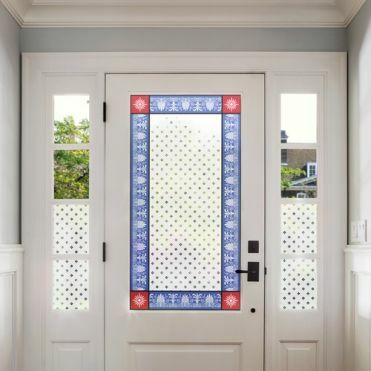 Patterned Window Film is a decorative material which has a clear or coloured pattern within a frosted film. You apply it directly to your existing glass for enhanced privacy. but mainly for decorative purposes. They are a fantastic and affordable alternative to curtains and blinds. We have a wide range of products available to suit most interiors, including period designs from the Victorian era. Window film is a self-adhesive product which takes minutes to apply using a soapy water solution, and the application tool provided with every order. 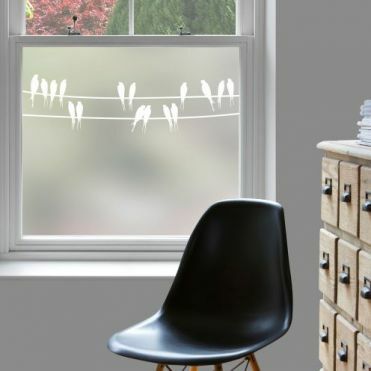 Contemporary and vintage patterned window film designs. 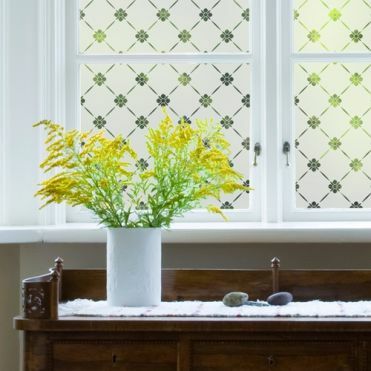 Stylish border designs in colour or transparent. Range of simple cut-out patterns and designs. Simple designs of frames and borders. Made to measure collection of designs. 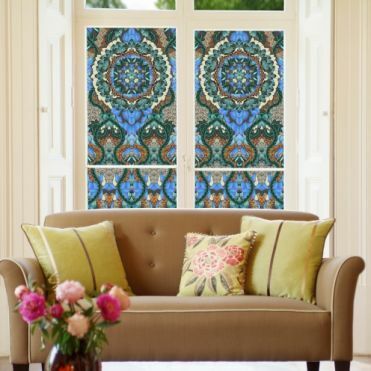 Collection of designs which can be resized to best suit your windows. Combination of etch effect and stained glass film designs. Create your own text based window film or stickers. Contemporary and period style designs. 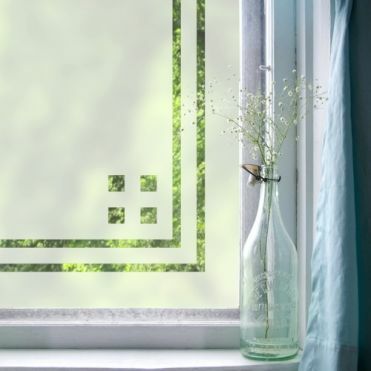 We have a wide range of patterned window film designs to suit all interior styles, which are either printed on or cut out of frosted film, depending on the intricacy of the design. So no need to update your windows with expensive patterned glass, just use our affordable patterned window film. 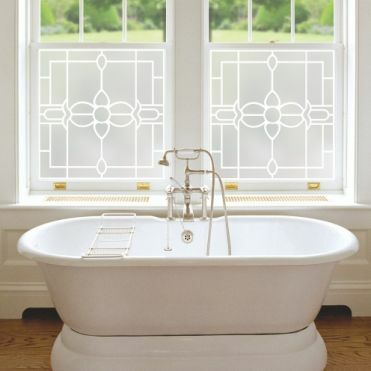 The decorative window film we use is suitable for bathrooms and kitchens and resistant to condensation, but avoid direct contact with water. 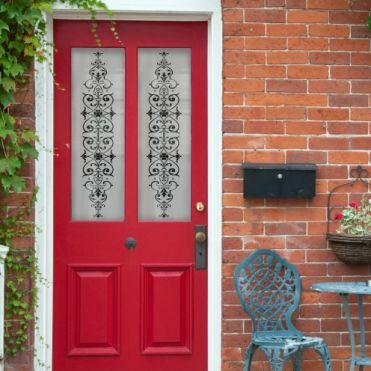 You can easily remove them at a later stage, making it ideal for rented properties. Simply put, it's a frosted film on which a pattern or design has been either cut out of the film or printed on it. 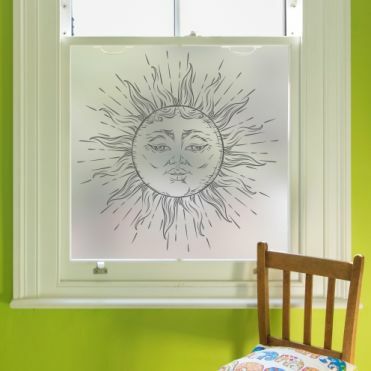 What is the difference between a printed window film and one where the design has been cut out? 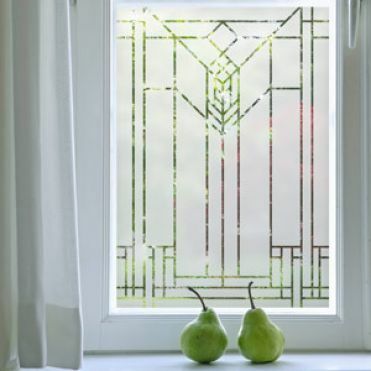 We have developed a printing method which allows us to print very intricate patterns on glass film. This method is very versatile and once the film is printed, it's very easy to apply. When designs are cut, we use a computer led cutter which accurately cuts the design into the frosted film. We then have to remove the unwanted elements and add an application tape to the design to help with the installation process. This method is a bit more time consuming as you have to wait until the film has cured to the glass before removing the tape.